It's perhaps too early to question the right of the average non-ebook to exist. But sooner or later -- perhaps within months -- I believe we'll be openly asking, "Why should it?" Is it really worthwhile to have them hogging so much space? When the room they take up could be used for something else, or perhaps just left as an open, inviting space? A few good books used to be a great look in a house. If you didn't want them to actually read, they made a nice way to decorate your home. There's still something to that -- especially with some kind of old hardbacks or finely bound classics. It can give a warmth or class to your decor. At least that's still true to my eye. But it's not hard to see the day coming when young people might see them and ask, "Why do you have all these space-hogging non-ebooks cluttering your shelf? You could put your games there." And really, if you think of it, it actually is kind of silly, since that was never their real purpose. I can see it both ways. We have a clash of cultures. Those of us who grew up with non-ebooks -- books -- got used to seeing them around. We might even take one off the shelf and look at it; of course not very often, Mom would want it back on the shelf for its decorative qualities. And I can see it from the point of view of young people today, that it's just so much dead weight. They're also very dusty. You can get dust bunnies on the tops of books, not good if you have allergies or are a neat freak. They really are dead weight, and they really do hog space. If you go to a library you can immediately see the problem. If everything in there were converted to digital copies, it'd all fit in your hip pocket. But as non-ebooks on many shelves -- shelf after shelf -- if just one fell over, it'd kill you. On the other hand, if they dumped every ebook in the world on you, you could offer back the taunt, "Is that the best you can do? That was a mosquito -- not quite." The point is it'd be very painless, even humorous. I've heard of communities moving their libraries across town by passing book after book along a chain of people a mile long. It reminds me of one of those examples like, "If you lined up every Jelly Belly made in a year, it'd stretch halfway to the moon and back." You just don't want to do it very often -- moving books or jelly beans to the moon or across town. But with ebooks, as a contrast, a neighborhood kid could put them in his backpack and take them to the new library on his way home. Easy! We're living in a transitional time, with things that used to take up an enormous amount of space being reduced to microbes. Now we think in terms of megabytes, gigabytes, and terabytes. The numbers get bigger and bigger -- astronomical -- but they take up no more space than a dime. The transition is going apace, but still, like I said, there are some hold outs trying to take the old world with them. So what do I foresee the library of the future will look like? It will still need tables and chairs; we still haven't found a foolproof way to reduce our bodies down to a microscopic size. There will still be the help lady at her normal size desk. A drinking fountain for people who get a tickle in their throat. Toilets for doing our business. And of course those Murphy tables for diaper-changing, even in the men's room(!). What am I missing? Oh yes, the ebooks, which will take up only enough space so they don't get lost! Or enough space so one guy isn't able to steal the entire collection. But let's say someone tried to steal them. They could have it rigged up like money in the bank, to blow up and spray red paint everywhere. Then they could have spare copies of everything in a cabinet and just bring out another copy to replace the first one. I'm personally doing my part in this great transition, throwing away my non-ebooks, donating them to Goodwill, or, more profitably, grinding them up and selling the paper mulch to bait shops to use as worm bedding. I've freed up so much space I might have to remodel my house and take off a room, meaning I'll then be saving on heating and cooling costs ... and paying less taxes as my house becomes smaller. 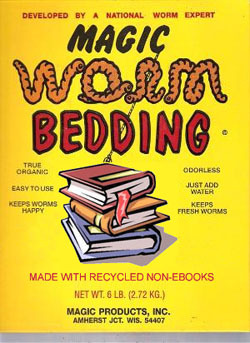 And look how happy the worms of the world will be.. There's no good reason to hang on to the extraneous junk of the past. Books may have been good for our great-grandparents, but ebooks are good for us.